This is a uniquely Hawaii dish. 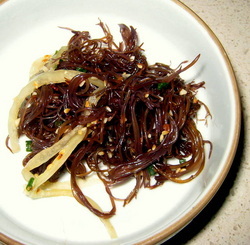 First of all "ogo" is a kind of edible seaweed. For scientific info, check out the University of Hawaii's page or the Hawaii Aquaculture page. When I was a kid, Dad picked ogo off Kahala when the fish weren't running. He'd come home, clean it by hand, make the sauce, pour the ogo into recycled peanut butter jars that were saved specifically for ogo, and then dole bottles out to friends and relations. On those days, everybody wanted to be his friend or relation. Sadly, most of the ogo has been picked away, and those who still have secret spots aren't telling. The upside is that aquaculture farms are now growing ogo, and you can buy fresh, pre-cleaned bags at Hawaii grocery stores like Don Quijote, Foodland and even Marukai. Getting it in the Bay Area has proved trickier, but I'm happy to report that you can get fresh ogo (and fresh poi) from Imahara's in Cupertino on Thursdays. Add water to a pasta pot with a little Hawaiian salt and bring to a full rolling boil. When this happens, put all the ogo in the boiling water and stir it quickly (my Dad says with chopsticks), until it turns green. This will happen *fast* only a few seconds. Take it out immediately and rinse in cold running water. Dad says this is very important to keeps the ogo crunchy. Otherwise it will melt into mush. Mix sauce ingredients together. Put ogo into jars (jelly jars or otherwise), mixing in with green and white onion slices. Pour sauce into jars. I use Mason jars. It won't look like a lot of sauce, but the ogo and onions will reduce down a bit. Cover tightly and refrigerate. Tastes best after it sits in the sauce overnight, but this is not required. Fight with siblings over who gets the biggest bottle.